A fun-loving businessman, Gabriel Gruner previously worked at Kraft Foods, where he "added value to brands and products that hardly changed during the last 50 years," he says. Now in the technology industry, he has already helped consumers change the way they watch TV. “I want to be strategically challenged and make decisions while having fun,” says Gabriel Gruner, CEO of TP Vision, a new joint venture between Philips and TPV—and for Gruner, a recipe for fun. After falling into his professional step with S.C. Johnson, and earning an MBA from the Institute for Management Development in Argentina in 1996, Gruner went on to product management for Danone. He later took his food marketing experience to Kraft Foods, where he worked for 10 years, picking up a certificate from the University of Virginia along the way. Fluent in Spanish, English, Portuguese, and German, Gruner was already nurturing his international versatility in this 10-year window. Gruner left Kraft in 2006 to join Philips as the marketing director for the Argentina, Uruguay, and Paraguay regions, and it was through his stead with Philips that Gruner came to be nominated as CEO of TP Vision for those same regions. TP Vision was officially launched in April 2012 as a joint venture between the Taiwan-based TPV Technology, which owns a 70 percent stake in the venture, and Royal Philips Electronics, which covers the remaining 30 percent. 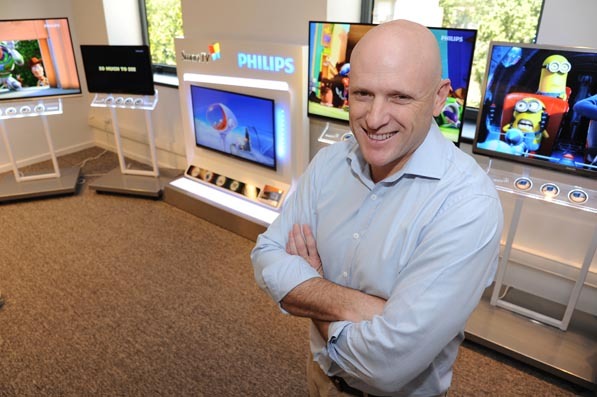 TP Vision acts as the brand licensee of Philips TV for Europe, Russia, the Middle East, Brazil, Argentina, Uruguay, Paraguay, and select Asian-Pacific countries. The company focuses on developing, manufacturing, and marketing Philips brand TVs to those countries, specifically in the hospitality market. Despite the drastic differences between industries, Gruner found similarities, as well. “The shelf life of chocolate is one year. The shelf life of a TV is one year,” he says. “It’s also fast-moving consumer goods, but you need to deploy much more meaningful innovation.” And for Gruner, innovation is fun. By moving and working in different cultures, Gruner has been able to further inform his ideas of retail and consumer culture. Much like the ability to speak multiple languages can enhance your view of the world, the ability to better understand international consumer behavior can enhance your versatility in the business world. This versatility, and Gruner’s own penchant for innovation, is what made him the prime candidate to lead TP Vision’s growth into the South American market. Drawing on aspects of his international interest, Gruner looks forward to continued growth for TP Vision in the coming years. “I expect to see profitable growth for TP Vision, and not just in Argentina, but all over the world,” Gruner says. “I would like to see myself as part of this plan, and not only in Argentina.” For Gruner, innovation is the driver, and Argentina is a point along the journey.